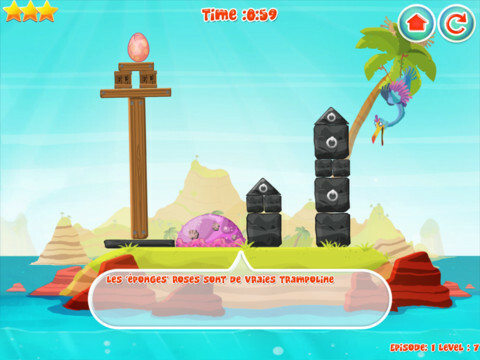 Last Egg, developed by Studio 3wg, is a strategy based game where your mission is to save the last remaining egg of this multicoloured bird and to return it to her safely. The storyline is that a plane lost its cargo and the last egg of this multicolored bird gets stuck within the cargo and you have to safely get it to the ground to save it. There are over 80 levels to pass throughout 4 episodes. It is very similar to how you pass Angry Birds. You have a certain time limit you must complete the level in and the faster you do it with the least amount of moves, the more points you get. Each level has a 3 star rating. You just have to pass the level with 1 star to unlock the next level, but if you want to master the game you will want to get 3 stars on every level. The graphics and sounds are ver well done and this game offers a ton of gameplay. With the next update they are going to offer a level editor where you can create and share your own created levels. Even though this game offers some nice soothing background music, it could get repetative and annoying for some. Luckily there is an option to turn if off. I have reviewed lots of games where there is no option to turn off the background music and it is really annoying. Overall this game is very fun and challenging and the levels get harder and harder over time. Currently it is FREE on the Apple App Store, but only for a few short days so grab it now!